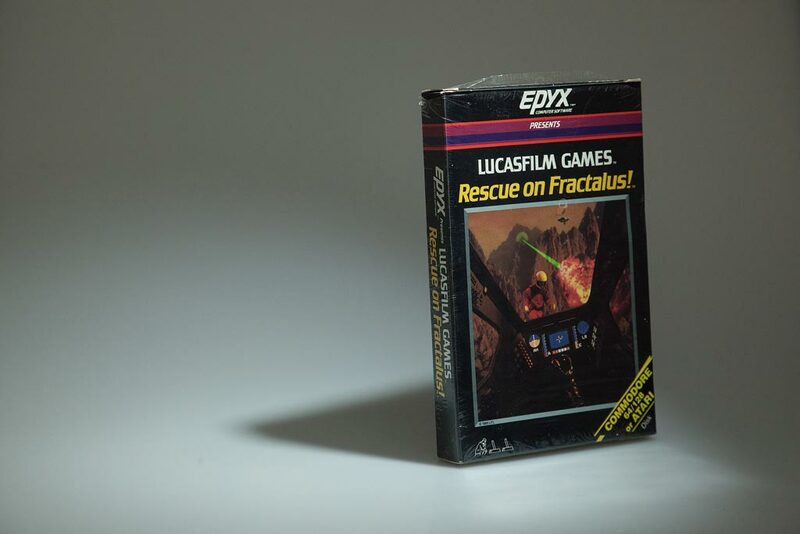 30 Years Later: Lucasfilm’s Fractalus Revisited – Obi-Wandi, a retrogaming retrographer. Oh how seductive the eternal evolution of technology! Oh what boredom lies in volumetric dust clouds of uncountable pixels, their toilsome birth betrayed only by the high-pitched struggle of a graphic card labouring inside a run-of-the-mill desktop computer. The mind slackens into a tupor of robotic keyboard spasms. Disbelief no longer needs suspension: with the visual display quite a spitting image of nature, the brain only needs to soften the roughest of edges. Oh what glory then the memories of old bestow on the stalwart art of retrography, the magic of 8-bit computing, beautifully preserved in Lucasfilm Games’ Rescue on Fractalus. And yet the most crucial ally in its creative success, the oft-forgotten and sadly underestimated manual of words crafted bold and true on sheets of paper rested inside boxes colourful and bold. 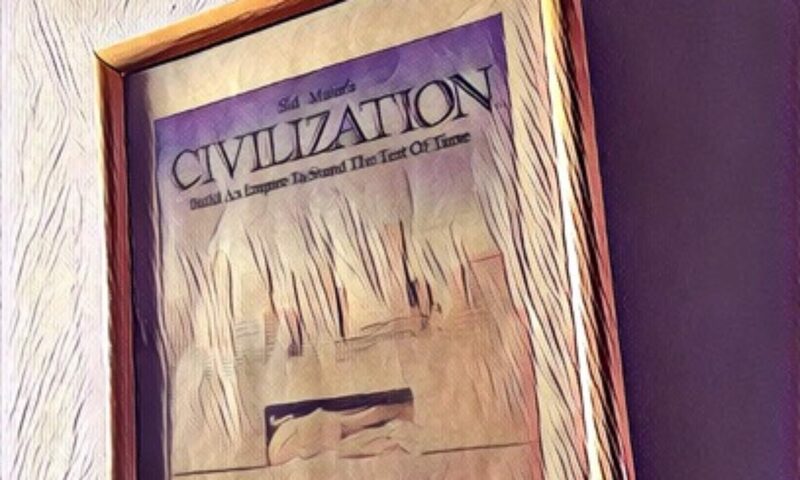 For whatever galactic alignment of planets, the early-mid 1980ies proved provident for the unknown possibilities of computer game design. Whole worlds started being stored on miniscule media. Exploration gradually introduced itself as a rival to basic tests of skill to claim from high score tables the title of gamers’ ultimate goal. In 1985, Lucasfilm Games seemed to replace your trusty Atari XE/XL or C64 – masters of colourful one-dimensional chunkiness – with a brandnew console of never-before-seen three-dimensional prowess once their dramatically christened computer game Rescue on Fractalus had finished loading. Shaking hands reach for the control stick of your Valkyrie Fighter, much is at stake on the moutaineous planet of Fractalus. As a member of the Air Fighter Corps, you are anxious to charge the treacherously mountaineous surface of Fractulus. The raging conflict has seen troubling losses on both sides, it is your task to see to it that you rescue as many downed Ethercorps space pilots as possible. The player’s mind is prepared to craft a crude two-dimensional, side-scrolling skill test into an epic battle. Yet what witchcraft doth David Foxe perform on the players’ eyes? Once catapulted from the mothership towards Fractalus, controls start flickering in your dashing cockpit, a few final nervous glances at the atmospheric manual are harshly cut short by the first deadly volley of laser fire from a Jaggi gun emplacement atop a mountain ridge: this is serious. The Air Fighter Corps looks rather determined to rescue the downed Ethercorps: the brilliant manual and the exciting presentation of the main narrative through dramatic photography made “Rescue on Fractalus” stand out as a game changing release. Photo by Andreas Wanda. Weaving the trusty Valkyrie capably through valleys and enemy death rays, players need to be on a constant look out for pilots and their downed fighters. The more “spacers” are rescued in a single run, the higher the score, with rare “aces” fetching extra points, all while the relentlessly depleting energy urges players on. David Fox thus combined a well-established game mechanic with the cornerstone of computing simulation, then in its barren infancy. Gamers are required to operate the (limited) controls; with fingers racing across the keyboard, it is in particular the absolutely brilliant necessity to open the craft’s hatch manually to let rescued pilots on board that makes Rescue on Fractalus feel utterly real. By the same token, rescues do tend to be more successful if the Valkyrie’s engines are not switched on prematurely. It is these subtleties that efficiently convey a real-life setting, technical limitations notwithstanding. Presentational qualities are, however, what lift Rescue on Fractalus beyond anything considered possible on 1980ies home computing hardware, all the more so considering that David Fox had completed the game in 1984 already. Rescue on Fractalus remains an astounding technological marvel to this day. At a time when Sublogic’s Flight Simulator treated 8-bit pilots to a handful of white lines and rather extensive green plains, or David Braben and Ian Bell restricted gamers to basic text tables in place of alien planets, Lucasfilm Games transposed gamers to a fully bitmapped world, in keeping with the titular promise of rescuing pilots on the eponymous planet. The immersion achieved by a programme of only a few dozen kilobytes was consummate. But unbeknownst to many, Rescue on Fractalus presciently indicated to gamers through its remarkable manual and precise box design that a new age of in-depth gaming experiences was upon them. Marketing for Rescue on Fractalus put the game’s first-person perspective front and center. The view from inside the Valkyrie of a pilot traversing the treacherous Fractalus mountains in despair graced every ad, article, label and leaflet. On top of the striking choice of perspective, the scene of a futuristic rescue in progress was realised photographically at a time when boxes featured painted or drawn images relating the essential gameplay elements. Thirdly, Rescue on Fractalus stood out even more as every screenshot showed different in-game situations from the player’s point-of-view. The catchy copy printed on the back of the sleek black box confidently promoted a “First Person Perspective in Both Flying and Rescue Sequences” and a “Realistic Three-Dimensional Landscape” – brave words at a time when Jumpman was considered the pinnacle of in-game graphics. Various advertisements for Lucasfilm Games’ Rescue on Fractalus by David Fox: all marketing materials emphasised how players would truly be right inside the cockpit, in the thick of battle. Lucasfilm Games surely didn’t promise too much with Industrial Light & Magic’s gripping photo composites of deadly warfare on an alien planet. 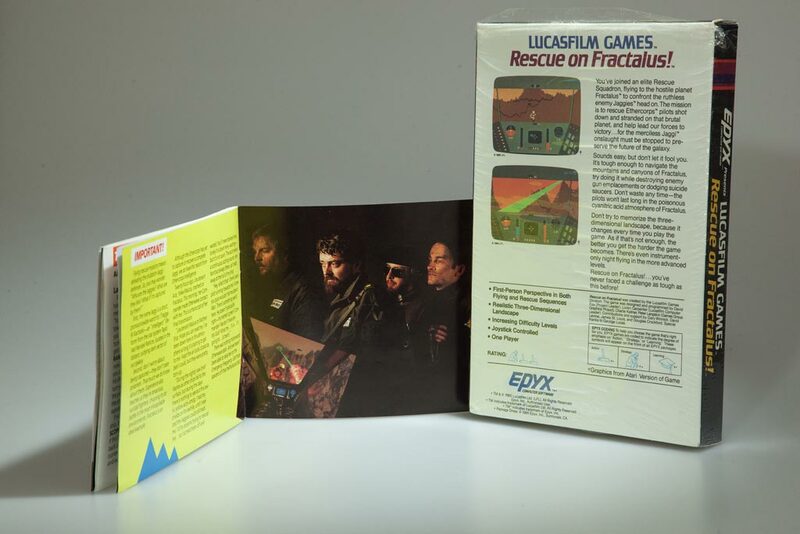 The contents of Rescue on Fractalus’ US version: The floppy disk contained both the Atari and C64 files, the manual is an exciting recruitment effort by the Air Fighter Corps: to sign up, boot David Fox’s excellent game. The European release was published by Activision. Photo by Andreas Wanda. There it is, an essential lesson on how to fly around a mountain peak to get a clear shot in air-to-ground combat. It is so important because, as the manual itself states, one might be inclined to consider a game broken if a well-placed volley of laser fire evaporates pointlessly. Yet in the new age of three-dimensional gaming, the environment and perspective are as much an ally as they are opponents. Depth of gameplay was instantly augmented a thousand fold. Such precise nods to realism opened up a product category previously shrugged off as time-wasting child’s play. Everyone who saw Rescue on Fractalus in action needed to take a deep breath, for this clearly no longer involved trippy dots tumbling about a TV screen. Gaming had suddenly become a window into a new world, first explained in David Fox’s Rescue on Fractalus. Rescue on Fractalus would be highly inspirational to a whole generation that was thus primed to probe ever further into what computing technology could achieve. It made computer gaming seem topical and important, involving and not distracting, exhilarating and meaningful. 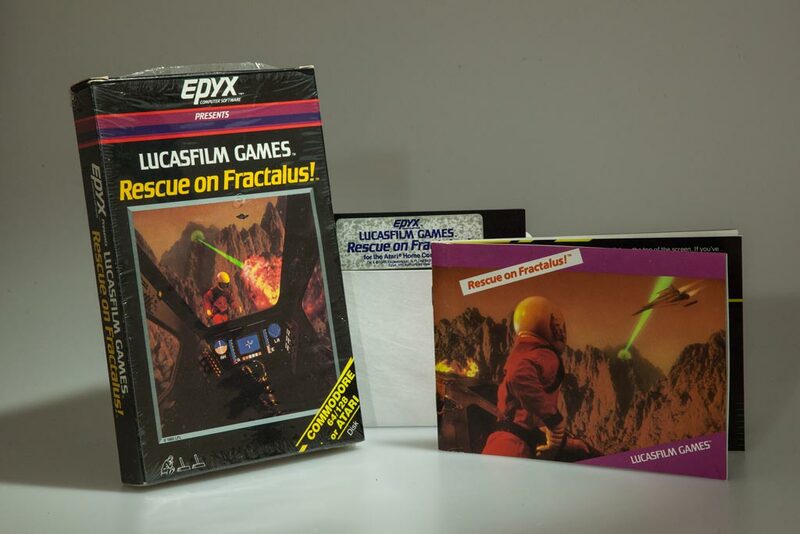 Rescue on Fractalus was the first game I revealed to friends to show off the raw power of the Commodore 64 and as such will never be forgotten. Meet the Air Fighter Corps: a new breed of video- and computer gamer, the first-person player. David Fox’s Rescue on Fractalus changed the world of gaming forever. 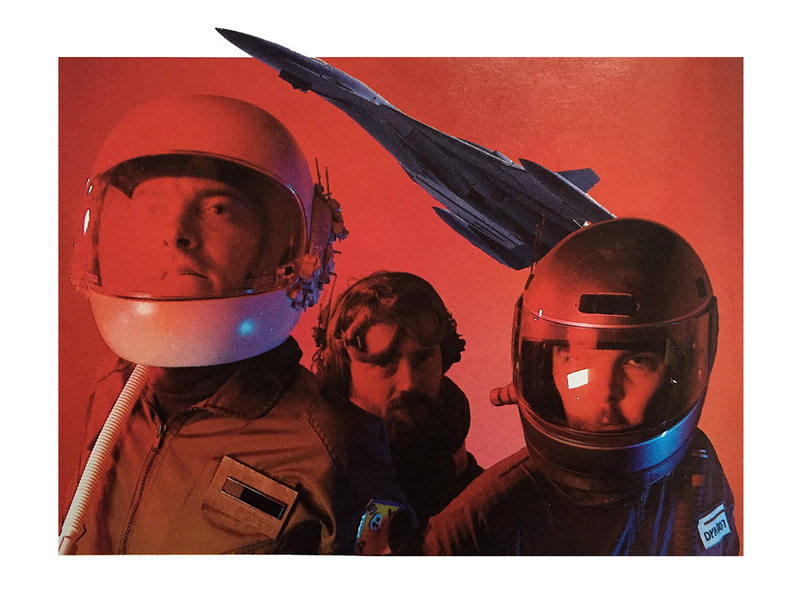 James St. Louis and Douglas Crockford, in 1985 you told us, the members of the Air Fighter Corps, “to get a future”, but it is you who gave the world the future of computer gaming.